– I’ve counted 25 of your products in the current Marset catalogue. I imagine you’ve designed quite a few more. What does the latest, Ginger, bring to the world of lamps? – I wanted to work with a new material and a new technology applied to the sector for the first time. 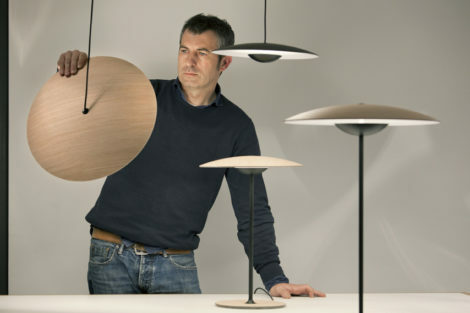 High-pressure shaping of several layers of wood and paper enables you to get a very thin lamp plate, just 4 mm thick. It would be twice as thick if you used plywood. Plus, since it is made of two materials you can put the white side on the inside to help reflect the light. The bulb holder is an aluminum “pin” which comes with LED’s and special optics to open up the light beam, although it in no way resembles a bulb holder. To dissipate the temperature transmitted by the LED, I chose not to carve out grooves but instead to make the aluminum thicker and keep the piece intact. As a whole, it is an exceptionally flat, smooth lamp. – Both Ginger and the Polo spotlight use LED’s. What is this technology missing to become the perfect source of light? – At first it was not very powerful and highly invasive. In just a short time not only have LEDs become high-performance and low-consumption, they are also increasingly warmer and smaller and have better light quality. The major revolution is that you can build your own light source. You can make your own customized bulb holder. You don’t have to go looking for anything. – Many designers feel nostalgic for incandescent bulbs. Have you gotten over that? – It seemed like a minor disaster when those bulbs were taken away. At first I amassed a great deal of stock. When I found white ones, I would buy them and hoard them. But I’m over the nostalgia now. Plus, today there are LED’s in the shape of white bulbs which provide amazing light. And there are aberrations, too. But generally speaking, things are going well. And LED’s allow you to design lights with standard sources, too. We work on a light as an object; it has to illuminate well, but it also has to decorate. – With LED’s, lights are increasingly slimmer and smaller. It seems like they’re going to vanish entirely. – Actually you can do whatever you want with them. The time will come when you’ll no longer be able to tell whether or not a light has an LED. The fact is that they give you a great deal of freedom. You can also use them in large lamps, such as the Soho, which measures 112 cm in diameter. The other day I saw one hanging in a market in Barcelona and I was thrilled. The important question is whether they provide good light and are attractive. – What strikes me is the simplicity of your designs. – I’m not into trendy things. It is difficult to remain on the sidelines: magazines, the media, the street. But to me value lies in simplicity, in something that is well made, that lasts for years. Being simple does not mean that the process of getting there is simple. It can actually be very complex. 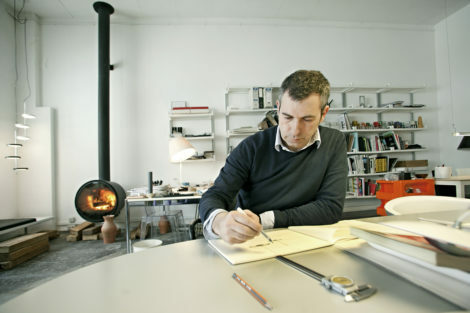 My master was the designer Lluís Porqueras. I began to work in his company, Vapor, in the late 1980’s. And he made everything easy. Objects have to be in a place without making noise, without clamoring for attention. If I find something spectacular, I immediately start suffering. – Why did you relaunch the Funiculí lamp, which was designed by Porqueras in 1979? – It is a very heartfelt tribute to Lluís Porqueras. I learned the trade from him. And of all the lamps he made, this one was the best. Tons of them were sold in just a brief period of time. Still, because of the lack of resources at that time, he was unable to manufacture a mold for the lampshade, for example. I just made use of an industrial piece that already existed. Now we produce it in its entirety with all its features, which are considerable. – Every period has had its materials and technologies. How do you think 2014 will be remembered in the future? – Things will appear very well made from the technological standpoint. But the perception will be that there is a mixture of periods, although everything is warmer, softer, quieter. People want to relax; they want things to be normal. When I got my start in Barcelona in the late 1980’s and early 1990’s, everything that was being done was outrageous. Today I find those chrome and black designer bars horrible. Yet they were also very important because they signaled that businesses were getting off the ground. Back then we designers were quacks – everyone wanted to be modern, or faux modern. – Today the typologies are also being constantly revised. 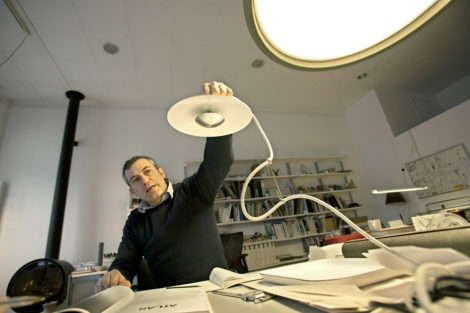 – It is difficult to invent new lamp typologies. Castiglioni did it with Arco and Parentesi. So did George Carwardine’s articulated tabletop flexible lamp. 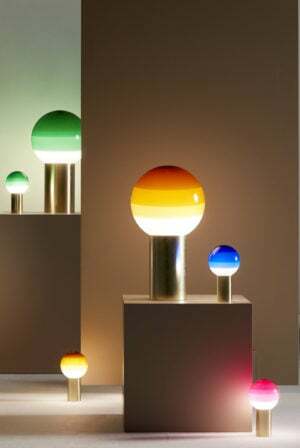 Ingo Maurer’s Yayaho was revolutionary with the advent of halogen. Today some of the innovation is coming from applying new materials and technologies. – Even though today you also design other products, you always veer back towards lamps. What are the challenges of designing lamps? – It is easier to design a lamp than a chair. You have the light dimension, which makes the object change when you turn it on. This is an advantage because it gives the product an added dimension. 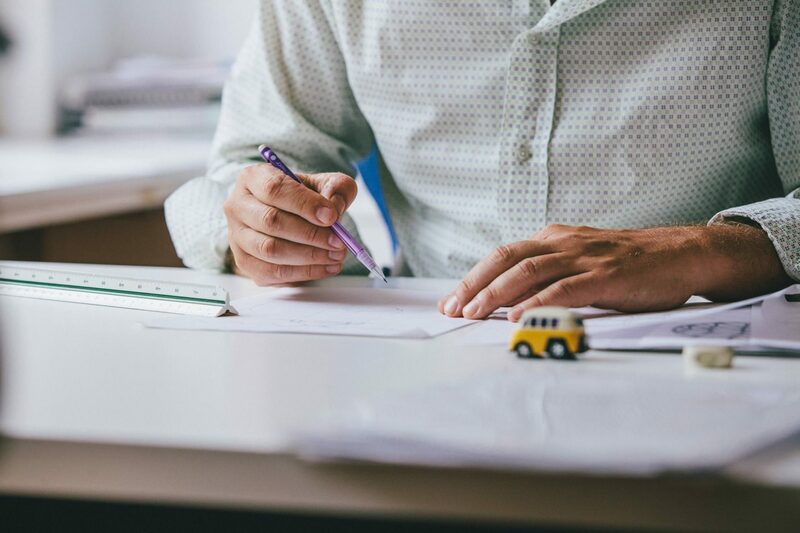 – As the Product Manager at Marset, what is your mission? – I am like the curator; I determine the perception of each lamp, the quality of light. When I joined Marset in 1996, they had already taken several steps towards carrying more contemporary products, and we just kept going further in that direction. I also think it is important to seek other technologies as a way of making a different kind of product. In 2000, for example, we introduced plastic in the company with a fairly risky proposition. And it was very successful. At that time, the Atlas lamp was a very unusual spotlight set inside a transparent case which held it in place. Everything was held together with just two pieces, without any screws or even a ball and socket to move the head. Plus, polycarbonate brought additional shine that gave it a different quality. When we launched it, we made two versions: one opaque and one transparent, which was the one we were nervous about. We thought it went too far, and in fact it’s the one that was incredibly successful. I have thoroughly internalized the Marset catalogue, and every now and then I make my own proposals. – The job also involves discovering new talents. – Marset receives many proposals, and only some of them are actually brought to fruition. 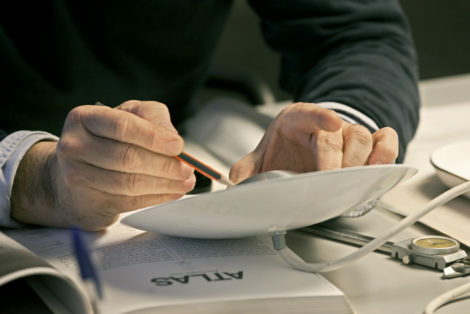 I saw the Scantling lamp by Mathias Hahn on a website where prototypes are published. I called him, we added it to the catalogue and today it is a great product. This possibility is one in a thousand. Publishing without being manufactured: that is what many young designers do today. I would be unable to do it. In the past, you published what had been manufactured. Today you publish the proposal. I’m from the old school.